Did you ever stop to notice...The crying Earth the weeping shores? Michael Jackson, who has just died aged 50, has been called the Elvis Presley of our times. He certainly was a global cultural icon with an enormous following in the West and East, North and South. And he used this celebrity status for more than mere entertainment (which he did exceedingly well): he had a long-standing history of releasing socially conscious songs that spread public interest messages with great ease and power. Mixing social messages with entertainment is a difficult and delicate art that only a few artistes manage to get right. Jackson was one of them — his mass appeal or sales didn’t suffer because he occasionally endorsed a worthy cause. He wasn’t overtly political like Pete Seeger, who turned 90 last month, but Jackson did it in his own unique way in songs like “We Are the World“, “Man in the Mirror” and “Heal the World“. In fact, Michael Jackson’s biggest selling UK single ever was a song about the environment: Earth Song. Released in November 1995, it sold over a million copies and was at the top of the charts for six weeks. Jackson wanted to create a song that was lyrically deep yet melodically simple, so the whole world, particularly non-English-speaking fans, could sing along. He conceptualized a song that had an emotional message. The video of the Earth Song was among the most expensive ever made – it was filmed in four geographic regions and involved scenes from the Amazon forest, Croatia, Tanzania and New York city, USA. It starts with a long tracking shot through a lush rain forest that then cuts to a scene showing Jackson walking through a scorched, desolate landscape. The environmental imagery then rolls on: dead elephants, evil loggers, belching smoke stacks, snared dolphins, seal clubbing, and hurricane winds. The video closes with a request for donations to Jackson’s Heal the World Foundation. Although not as widely selling, ‘Will you be there‘ is my personal favourite among Jackson’s socially conscious songs. First released as a single in 1993, it was taken from the 1991 album Dangerous and also appeared on the soundtrack to Free Willy – the charming story of a boy befriending a killer whale. The song won the MTV Movie Award for “Best Song in a Movie” in 1994. It was also included in the album All Time Greatest Movie Songs, released by Sony in 1999. Jackson also performed songs for the film’s two sequels. However, Earth Song had much wider and more lasting appeal, almost becoming an anthem for the global environmental movement in the past decade. But its real impact was not among the converted – with this song, Jackson took the green message to the heartland of the Facebook generation. “The song is a very rare thing: a hit record with a powerful message about our impact on the environment,” says Leo Hickman writing in The Guardian earlier today. He adds: “What struck me today watching the video was how it is very much the product of an age before climate change had become a mainstream concern. The lyrics and imagery speak of over-fishing, deforestation, and smog. All of them are still huge and legitimate concerns, of course, but they have all now become somewhat dwarfed by climate change, the most compelling and over-arching environmental issue of our age. Talk about moving images moving people! What happens when a small and culturally diverse group is flown in from different parts of the world, put up in a comfortable hotel, fed well — and mandated to watch two or three dozen excellent films and asked to come up with a selection of ‘the best of the best’? That pretty much sums up the experience of the final jury process of international film festivals that have a competitive element. The festival secretariat lines up the logistics but entrusts all the rankings and selections of entries to an independent jury – which typically serves without pay, and works long and hard. Hosting the Wildscreen Film Festival in Colombo, Sri Lanka, which ended last evening, brought back memories from eight years ago, when I served on the global jury of Wildscreen festival in Bristol in October 2000. It wasn’t just the turn of the millennium that made the festival especially remarkable that year. In some ways, Wildscreen 2000 marked a significant change in how wildlife and natural history films are assessed and honoured. I’ve done this a few times before and since 2000 — among them Earth Vision (Tokyo) in 1993 and Japan Wildlife Festival (Toyama) in 2003. But being on Wildscreen jury was special, for it’s considered to be the world’s largest and most prestigious wildlife and environmental film festival — the ‘green’ equivalent of the Oscars. Serving on film festival juries can be both tedious and highly rewarding. On the plus side, I get to watch the best of contemporary factual film making on these subjects from all over the world, and then discuss their relative merits with some of the best professionals in the industry. The downside is that no jury can ever satisfy all film makers who enter their work, nor come up with a selection that is universally accepted: after every festival, there are those who feel their creations didn’t receive the recognition they deserved. Among my fellow jurors were conservationist Dr Lee Durrell and Canadian film-maker and co-inventor of Imax Roman Kroitor. Jane Krish, then Executive Director of Wildscreen, kept us going and made sure there wasn’t too much blood on the expensively carpeted floors of the Bristol Marriot hotel where we were holed up. Details of what happened during that week is now buried too deep beneath sediments of memory. I remember watching and discussing some great films in great company and racing against time to reach our decisions for the awards night. Parallel to this, the festival’s multiple events were taking place in nearby venues but we couldn’t join them – except some social events in the evenings. “In the past week my jury and I have, in effect, left the human race. During our four days’ viewing we have seen no less than 54 films. And in that time we have tramped over billions of tons of sand, swum in every ocean of the world with trillions of fish, experienced 80 full moons, watched the production of 30 tons of elephant droppings, around 120 copulations (not ourselves), 15 rapes (not ourselves), 210 killings including 30 infanticides, several thousand insect bites, and we have done all this in temperatures of 50 degrees Fahrenheit below and temperatures of 50 degrees Centigrade above. “In those aforementioned copulations we were privy to the sight of a pair of 1 ton testicles accompanied by what looked like 3 meters of stout garden hose, but was referred, very tastefully, by the narrator as a ‘flexible friend’. From then on, each member of the jury took turns in announcing winners in various categories, some technical and others more editorial. Each winner received the coveted Panda Award, affectionately (and unofficially) known as the ‘Green Oscar’. Wildlife film-makers from Australia, Britain, France, India, the Netherlands, Norway, South Africa and the United States shared the honours that evening. Each Panda award was introduced with a brief citation. I presented two: the Conservation/Environment Award and the award for the best film entry from a country that did not have a long tradition of making natural history films. When presenting the latter, I noted: “It is tempting to draw parallels between the natural world and the world of natural history film making. There are enormous inequalities and disparities in both. Film makers everywhere find it increasingly difficult to raise adequate budgets, but this has always been a stark fact of life for film makers in those parts of the world that lack a long tradition of producing natural history films. In these harsh conditions, the resourcefulness and ingenuity of film makers are tested on many fronts. 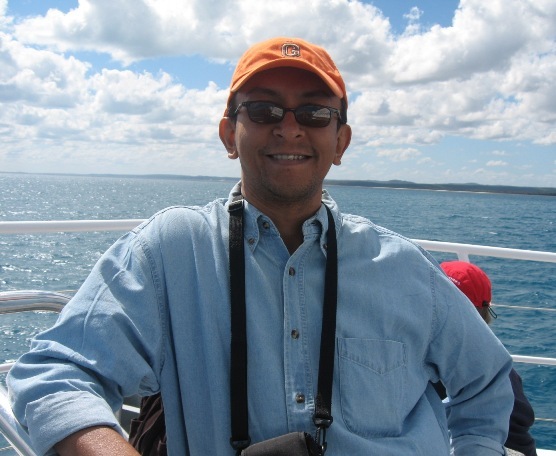 The award went to Indian film maker Mike Pandey, for his film Shores of Silence: Whale Sharks in India. The 25-minute film, made in early 2000, was the first ever revelation of the killing of whale sharks on the Indian coastline. It so stirred the collective conscience of the authorities, that the government banned the hunting of these endangered marine creatures seven months later. Every jury’s selection sends out signals, and this is especially so when it concerns the natural history film industry’s most coveted awards. Beyond selecting the winners, our jury also recommended the expansion of the festival’s scope in two ways. Firstly, we pointed out that simply documenting animal and plant behaviour and their habitats was no longer adequate in a world facing a multitude of environmental crises. There was an urgent need, we said, to mainstream films that looked at the nexus between the natural environment and human society – both conflict and harmony between the two. Secondly, we recognised the rapid changes taking place in the worlds of broadcasting and web, which challenges film makers to try out new formats or genres, including some that used much shorter durations than those used in wildlife and natural history films until recently. Reviewing eligible film formats was necessary, we said, in an industry that was embracing multimedia to retain or attract eyeballs. Oz challenge to Japanese whaling – on YouTube! Who said YouTube is only for activists and video enthusiasts to share their content? The above appeal is by Australia’s Environment Minister Malcolm Turnbull, who’s using the popular new media platform to reach out to children and young adults in Japan in a campaign aimed at stopping Japan’s stubborn insistence on whaling. The Australian Department of Environment has taken out a YouTube channel where this and several other videos are on offer. This is very encouraging – to see a government putting aside diplomatic niceties and taking a campaign right to the heart of a society that is still culturally attached to whale meat. For sure, Australia is also active in inter-governmental negotiations to sustain the global ban on whaling, but addressing the issue from the demand side and future generation angle can make the anti-whaling positions stronger. CANBERRA, Oct 9 (Reuters) – Australia has taken its battle against Japanese whaling in the Antarctic to the Internet, with a new YouTube campaign unveiled on Tuesday that targets Japanese children. “Can you imagine what life on Earth would be like without these magnificent creatures? Hundreds of years of whaling have nearly wiped them out,” Australia’s Environment Minister Malcolm Turnbull says in the video, subtitled in Japanese. 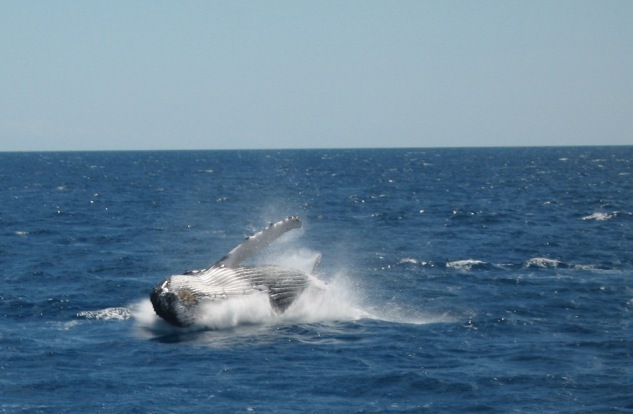 Japan plans for the first time to hunt 50 humpback whales in the Antarctic over the coming summer, with the endangered animals currently migrating south along the Australian coast. Japan also plans to hunt 935 minke whales for scientific research. The Japanese whaling fleet, hampered by a fire on the factory processing ship Nisshin Maru last February which killed one crewman, was recently bolstered by the addition of a new chaser vessel. Australia’s government, facing re-election in weeks, has dismissed as futile the opposition’s calls for legal action over Japanese whaling in Australia’s Antarctic Whale Sanctuary, which is not recognised by other nations. Turnbull said Canberra would fight in the court of public opinion. Last April in Melbourne, I listened avidly to the doyen of Australian science journalists Robyn Williams compare science journalists to whales as he opened the Fifth World Conference of Science Journalists. They both respond to lots of free drinks and eats. In fact, they like to drink vast amounts (though not necessarily the same liquids!). There is evidence to suggest they are both intelligent species. They are both endangered too – there are some nasty people out to get them. Both are free spirits – don’t like being trapped or hounded. Back in Australia on a short private visit, I finally manged to catch up with these marvelous creatures that I have admired, written and spoken about for a quarter of a century. 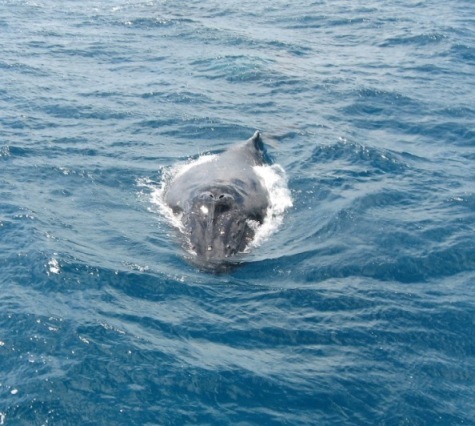 Today, I went whale watching in Hervey Bay, north of Brisbane in Queensland. It was an awe inspiring experience. Here are some photographic highlights. I’ll write more about it when I have caught my breath again. Is this the world’s largest tail? Oh boy, what a tale to tell! Science journalists and whales: much in common? Science journalists have been called many names, some more memorable than others. Speaking at the inauguration of the 5th World Conference of Science Journalists, Robyn Williams — the doyen of science broadcasting in Australia — suggested a new analogy: they are like whales in many ways. They both respond to lots of free drinks and eats. In fact, they like to drink vast amounts (though not necessarily the same liquids!). There is evidence to suggest they are both intelligent species. They are both endangered too – there are some nasty people out to get them. Both are free spirits – don’t like being trapped or hounded. And they are known for occasional mass strandings – in the case of science journalists, it first happened in Tokyo (which choice whales might not approve! ), followed by Budapest, Sao Paulo, Montreal and now – Melbourne. These are the cities that have hosted World Conferences of Science Journalists, beginning in 1992. It’s an event that happens approxiatemly every three years — or as soon as the next host can line up the massive logistics involved in receiving, feeding and keeping the several hundreds whales – sorry, science journalists – happy. Robyn is not just a very entertaining broadcaster, but has has written more than 10 books — one of them a novel, 2007: A True Story Waiting to Happen. By coincidence, the story involves whales – one of his favourite species – and its action starts in April 2007! It is the year 2007. The weather is now wreaking turmoil on the planet. Hurricanes, cyclones, tsunamis, floods, fires, droughts and diseases are sweeping the world with increasing frequency and severity. The poor countries are worst hit, but even the rich ones are no longer immune from major disruption. Big business is worried. In April 2007, the animals take matters into their own hands. An enormous pod of whales sinks a whale-killing submarine. Massive flocks of pelicans close airports around the world. Huge herds of cattle bring freeways everywhere to a halt, burying cars under mountains of steaming dung. Desperate to find a solution to the global chaos, the President of the United States calls on the world’s top scientists to explain what it happening and how to stop it. One man, his daughter and her dog hold the key, but before things can get better, they have to get a great deal worse. Hmmm. Robyn is known and admired for many talents, but perhaps the world hasn’t yet appreciated his powers of prescience. Having blazed new trails in taking science to the public, Robyn now presents The Science Show on ABC radio.